Randy credits much of his success to his long standing membership at the Detroit Golf Club. Many of the members at DGC over the years have been manufacturer's representatives in the automotive industry. In fact, Randy can attribute more than $1 million in legal fees to one golf game that he had at the DGC several years ago with a fellow member. Randy's practice has been devoted almost exclusively to representing sales people in commission disputes since 1993. "We only represent sales representatives. We do not represent principals. Part of the reason for this is that it goes against my nature to argue in court against the rights of a sales representative. Additionally, I would not want to have my words in one case, where I may represent a principal, used against me in another case, where I represent a sales representative. We avoid these problems by solely representing sales representatives and other commissioned sales people." In a recent 12 month period, Randy Gillary and his associate, Kevin Albus, obtained awards and settlements of more that $20 million in favor of the firm's clients. "Our office has successfully represented many hundreds of sales representatives over the years. Much of our business comes from referrals by satisfied clients. Occasionally, we get new clients referred to us from defense counsel in other cases that we have handled, and in some cases we have even gotten referrals from defendants who we have successfully sued." The Internet has also had a significant impact on the legal business in general, and on The Law Offices of Randall J. Gillary, in particular. "The Internet has impacted our business in two key ways. First of all, sales representatives are generally computer savvy and perform research on the Internet. If a sales representative has a sales commission problem, he or she will often check the Internet and look for a lawyer who specializes in sales commission cases. Sales representatives generally are smart enough to realize that it is not a good idea for their case to be a learning experience for their lawyer. The practice of law, like most other businesses, is a speciality business and it's definitely a good idea to have someone represent you who is a specialist in solving the type of problem that you have. The second way that the Internet has impacted our business is that defendants and defense attorneys also do research on the Internet. One of the first things that a defense attorney or a defendant does after they are served with a complaint in one of our cases is to "Google" our office on the Internet. When a defendant or defense attorney investigates who we are, they will find out that all we do are sales commission cases and that we are very good at what we do. We have found this results in many cases settling at a very early stage." "In our office, we have somewhat of a division of labor between Kevin and me. I handle the court appearances, depositions and trials, and Kevin does the legal research, prepares the briefs and handles discovery documents, including the preparation of spreadsheets for unpaid sales commissions in our cases. Kevin is probably the only attorney in the country who spends virtually all of his time performing legal research, analyzing sales commission records, and performing related tasks solely for the purpose of making sure that sales representatives get paid the commissions that they are rightfully owed. Kevin has probably written more legal briefs on sales commission issues than any attorney in the country. He does a great job. One of the advantages of our firm is that they are very few issues that will come up in a sales commission case which we have not previously addressed in one of our prior cases. This helps to give us a leg-up on our competition. We spend our entire working time thinking about and working on sales commission matters." 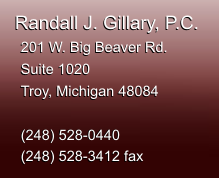 Virtually all of the sales commission cases handled by The Law Offices of Randall J. Gillary, P.C. are handled on a contingent fee basis. The client is responsible for costs such as filing fees, deposition fees and expenses, witness fees, travel and other out-of-pocket expenses. These costs are normally covered by a retainer which is deposited in the firm's client trust account to be used during the course of litigation. The firm only gets paid attorney fees if, and when, it recovers sales commissions for the client. "Occasionally I have prospective clients ask me about having our office handle a sales commission case on an hourly basis. I have yet to agree to do that . I run my business the same way that most sales representatives run their businesses. In many instances we have to work for more than a year and in some cases more than three or four years, before we get paid. Obviously, that hurts cash flow, but that is they way that we operate. I want our focus to be on winning and not on generating billable hours. Believe me, there is nothing more motivating than to realize that if you win you get paid and if you lose, you don't. It makes us work harder." One of the unique aspects of the firm is that Randy and Kevin are prolific legal writers. Randy's first law review article was entitled, "The History of the Procuring Cause Doctrine in Michigan". This was written by Randy in 1995 and published in The Michigan Bar Journal at 74 Mich. B.J. 1264. Kevin was a law clerk for Randy at the time and did much of the legal research for the article. This was followed by "Michigan's Sales Commission Act Revisited Again -- Or, Does 'Intentionally' Mean 'In Bad Faith'? ", written by Randy and Kevin and published in 2001 at 2001 L. Rev. Mich. St. U. Det. C.L. 965. This article was written about a case that was pending at the time in the United States Court of Appeals for the Sixth Circuit in Cincinnati. There were two other law review articles written about the case by lawyers advocating for the side of the principal. The key issue in the underlying case was whether or not a sales representative was required to show that a principal acted in bad faith when withholding sales commissions in order to win an award of penalty damages under the Michigan Sales Representatives Commission Act. Randy's position on behalf of his client was that an intentional failure to pay, triggering penalty damages under the Act, did not require a showing that the principal acted in bad faith. The Sixth Circuit Court of Appeals certified the question to the Michigan Supreme Court, as requested by Randy, and the Michigan Supreme Court unanimously ruled in favor of Randy's client, holding that "intentional" does not mean "in bad faith". As a result, the jury verdict affirmed an award of penalty damages and attorney fees under the Sales Representatives Commission Act. In reaching its decision, the Michigan Supreme Court cited Randy and Kevin's article as partial authority for the Court's ruling. As far as Randy and Kevin know, this is one of the very few times that any appellate court has ever cited an article written by the attorneys in the case before the court in the court's decision. See Kenneth Henes Special Projects v. Continental Biomass Industries, Inc., 468 Mich. 109; 659 N.W.2d 597 (2003). Randy and Kevin also wrote "Unsupportable Limitations on Michigan's Procuring Cause Doctrine in the Case of Roberts Associates, Inc. v Blazer International Corp." in 2004. This is published at 2004 Mich. St. L. Rev. 101. In 2003 Randy published his first book, Protecting Your Commissions -- A Sales Representative's Guide. This is a handbook for salespeople. The book starts with key terms and provisions that should be included in sales representation agreements. It then addresses problems that can occur during a sales representation relationship and concludes with litigating sales commission disputes. Randy often recommends that new clients read his book to get an understanding as to how he thinks and what they are in for with their case. The book has received excellent reviews on Amazon.com. Disclaimer: This is an advertisement. The materials on this web site have been prepared by Randall J. Gillary P.C. for informational purposes only and should not be considered legal advice. This information is not intended to create an attorney/client relationship, and receipt of it does not constitute an attorney/client relationship. Internet users and online readers should not act upon this information without first seeking professional counsel.